After weeks of heavy pressure from China to stay away, 47 countries with embassies in Oslo accepted invitations to attend an unusual Nobel Peace Prize ceremony in the City Hall, where jailed winner Liu Xiaobo’s own chair will be empty. Eighteen countries chose to decline. The numbers had been going up and down for weeks, but Geir Lundestad, director of the Nobel Institute, could update curious reporters at a press conference on Thursday. Lundestad said two of the countries that had said they would not come changed their minds, and would attend after all: Ukraine and the Philippines. Algeria ended up declining the invitation while an envoy for Argentina would join colleagues from other countries in the City Hall on Friday, as would a representative from Colombia. 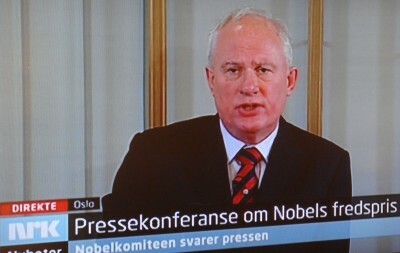 The ambassador from Sri Lanka didn’t respond to the Norwegian Nobel Committee’s invitation, according to Lundestad. That, Lundestad said, indicated that 45 countries would attend and 18 would not, including China, Russia, Iraq, Iran, Cuba, Morocco, Egypt, Pakistan, Afghanistan, Kazakhstan, Tunisia, Saudi Arabia, Sudan, Vietnam, Venezuela, Algeria, Sri Lanka and Argentina. Lundestad told reporters that it’s the Nobel Peace Prize winner who decides who he or she wants to invite among prominent guests. Otherwise, only the less than 70 countries with embassies in Oslo are traditionally invited, and two-thirds of them will attend this year despite efforts by China to mount a boycott of the ceremony because they’re unhappy their biggest critic, Liu Xiaobo, is the winner of this year’s prize. Lundestad said the Nobel Committee initially got word from Liu that he wanted around 140 Chinese human rights activists to attend. When it became clear that most wouldn’t be allowed to leave China, another list of around 60 invited guests came in. It included, among others, the outgoing speaker of the US House of Representatives Nancy Pelosi. Lundestad stressed that it wasn’t the Nobel committee that invited Pelosi, for example, but she was among the names on the winner’s guest list. Also attending will be Norway’s King Harald and Queen Sonja, despite threats from the Chinese authorities that their presence will further worsen relations between Norway and China. They will also attend the Nobel Concert on Saturday. Nobel Committe Chairman Thorbjørn Jagland said he appreciated support from the US Congress, which voted in favor of congratulating Liu with his Nobel Peace Prize, and from the European Union, which decided that all of its members should be represented at the ceremony in Oslo. Serbia, the only EU nation to signal it would not attend, reportedly received a message from the EU that it should. Chinese officials’ furious objections to the prize continued to build. They have imposed massive censorship around this year’s prize, blocking access from China to websites for, among others, CNN, the BBC and Norwegian Broadcasting (NRK). The Chinese authorities consider Liu a criminal, and he’s serving an 11-year prison term in China for advocating human rights and freedom of expression. NRK reported early Friday morning that it now seems dangerous to oppose the government in China, with more human rights activists being rounded up. The embassy in Oslo drew its curtains and staff refused to respond to a demonstration by human rights activists outside, who demanded Thursday afternoon that Liu be freed.